In Business Since 1820? | Groton Pixel WebFarm In Business Since 1820? Since that time, the house has contributed to the town’s business landscape as a retail establishment, a manufacturing establishment, a farmhouse, a scientific laboratory, a library, a law office, a medical office, and now as a web design firm. Across Main Street from us, on the campus of Lawrence Academy, is the Brazer House. School headmasters have traditionally lived there, but back in 1820, Brazer House was the home of William Farwell Brazer. who built his dry goods store across the street on 19 acres that he inherited from his father. The walk from the Brazer House to the Brazer Store would have been an enviably short commute. 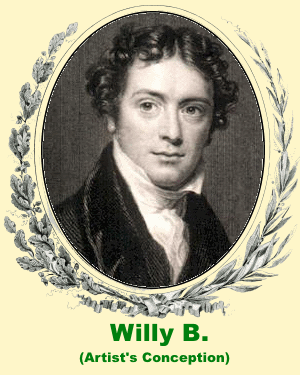 We have no picture of Willy B., but we imagine he looked a bit like English chemist and physicist Michael Faraday, because that’s who came up when we did an image search for old-timey store clerks. The Brazer Store served exclusively as a business establishment until 1829, when part of it was converted into a residence by a new owner, Jeremiah Kilbourne. But Jerry K. and his family, while living in the home, maintained its business tradition for the ensuing decades of the Nineteenth Century by making hats and farming the land out back that would someday become Town Field. 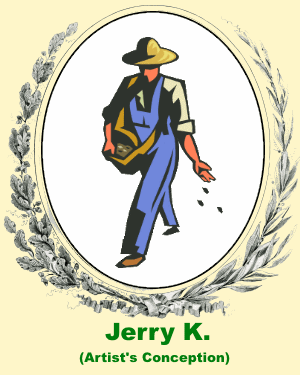 Jerry’s the guy represented in our logo by the seed-spreading farmer with the big straw hat. We have no reason to believe that Jerry was anything other than a sane and stable pillar of the community, but Lewis Carroll and Walt Disney have us programmed to think of all hatters as Mad Hatters. Look for more about Jerry in a future post. How long ago was 1820? 1820 is closer to the 1655 founding of Groton than to the present day. 1820 is closer to the Pilgrims landing on Plymouth Rock than to Neil Armstrong landing on the Moon. In 2015, Barak Obama is our 44th U.S. President, and hardly anyone can rattle off the names of his forty-three predecessors. But in 1820, James Monroe was only our fifth president, and four out of those five were still alive–Adams, Jefferson, Madison, and Monroe. In 1820, future president Abraham Lincoln was eleven years old and still looking forward to growing some peach fuzz on his chin. 1820 was just about the midpoint of the “four score and seven years” that Lincoln would later reckon from the Declaration of Independence to the Gettysburg Address. The United States flag had 21 or 23 stars in 1820, as two were added midyear for the brand new states of Alabama and of Maine (formerly known as “Extreme North Massachusetts”). In 1820, there were still former Minutemen and Revolutionary War veterans living in Groton. Yes, we said Minutemen, those guys who kept their drums, fifes, and muskets ready to go in sixty seconds or less. After all, 1820 was closer to the end of the Revolutionary War than we are to the end of the war in Vietnam. In 1820, when those retired Minutemen entered a newly-built dry goods store on Main Street, they would have used the same door that our clients still walk through today. When they picked their chosen items off the shelf, it would have been in the same room that now serves as our main office. And when they gazed out the window at the commons in front of the church, they may have reflected fondly on an April morning assembly in 1775, and subsequent march to help protect the rebel arsenal in Concord–down a dirt road that has since become Route 119, left turn onto Strawberry Hill, and follow the sound of the shot heard ’round the world. It’s probable that at least some of the feet from that march made an impression on the floorboards of the Brazer Store. Naturally, those Revolutionary War veterans would have reminisced with the Brazer Store’s proprietor, Willy, about his grandfather–Captain Henry Farwell–who had led the Groton Minutemen and then commanded many of their number in the defense of Bunker Hill. While in the Brazer Store, you probably couldn’t mention Captain Farwell without Willy launching into a story about Grandpa Henry and the British musketball that lodged in his spine during the Battle of Bunker Hill. Although left for dead on the battlefield, Captain Farwell refused to pass from this earth until he saw his country free. He later had that musketball pried from his vertebrae and engraved with the date as a souvenir. Surely Willy would have shared that story with his customers often enough to embed his words permanently into the walls–the same walls in the room where I am typing this blog post on a snowy January day in 2015. When I lift my fingers from the keyboard, it’s almost quiet enough for me to hear Willy’s voice echo through time. So yeah, that’s what we mean when we say that we’ve been in business since 1820. Really, we have quite a history to live up to. ‹ Is your iCloud password in danger?